Search engines automatically crawl your site and index the pages for searchers. But if you use structured data, it helps search engines understand what your content is about. This can encourage clicks – and maybe even help improve rank. The different ways to use structured data in your pages’ HTML markup to improve SEO are constantly evolving. Here are some new tips and tools I’ve picked up that can help you take advantage of the opportunities in SEO markup and structured data for your content campaigns. Host content directly on Facebook using the Open Graph, HTML5 tags, op:tags and op-* classes. Deliver content using Apple News Format or RSS using Open Graph and Schema.org. AMP is an open platform launched by Google. You can implement AMPs using Schema.org in JSON-LD or microdata format. Formatting your pages to load quickly is good for user experience and helps you increase organic reach on different platforms. Jon Parise of Pinterest did some early tests of AMPs and found they’re an impressive four times faster – and use eight times less data – than regular mobile pages. With stats like that, you can see why they’ll likely become more popular for mobile users. It’s still early days, so it’s unclear if AMPs will have direct impact on pagerank. 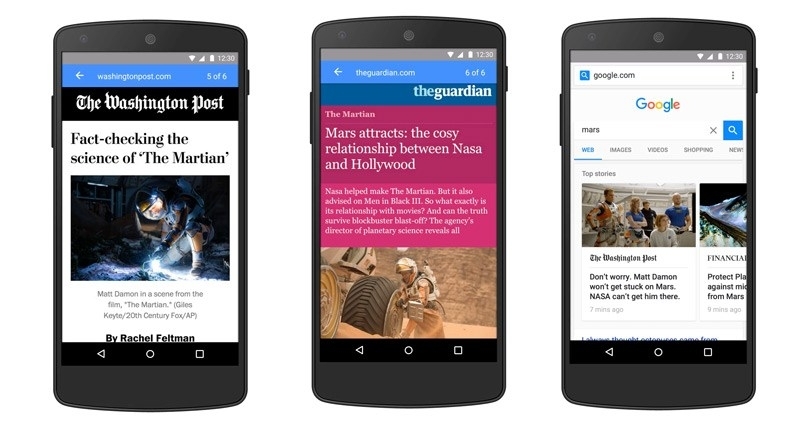 However, it does seem that Facebook favors their instant articles. 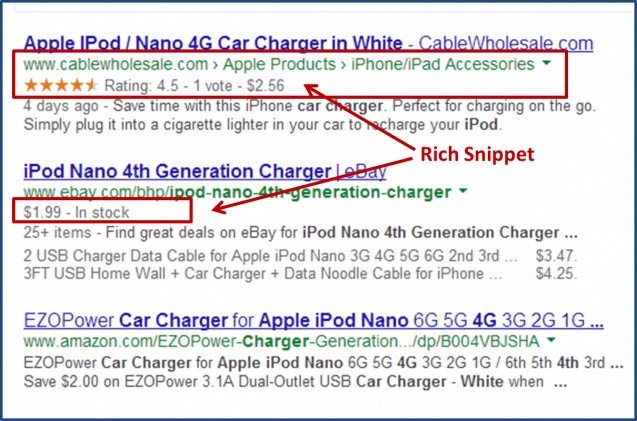 You can optimize your pages to display as rich snippets in Google using Schema.org markup. Doing so will also increase your chances of appearing as Google’s featured result. 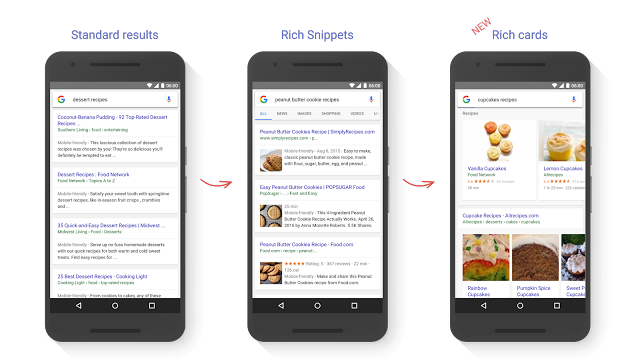 Rich snippets are now evolving into rich cards, which are designed to deliver an improved mobile user experience. You can use the same methods to create rich snippets as rich cards. Right now, only movies and recipes are supported. That said, Google has updated its documentation, and it looks like rich cards will be the markup strategy of the future as they’re implemented more widely. If you use structured markup to improve your pages’ SEO, you should know about the risks of a Google penalty. Google now serves manual action penalties to sites that use structured markup in a manipulative or deceptive way. For example: having a recipe markup saying the recipe has several five-star reviews, while on the actual page there are none. Most webmasters out there aren’t deliberately putting falsehoods in their structured markup to manipulate search, but you can still end up with this penalty by accident. If you have a penalty, your pages will be penalized in search results until you fix the problem. It could be a site-wide match, affecting your whole site, or a partial match, affecting certain pages. Once you clean up your markup, you can submit a reconsideration request with Google to get the penalty removed. Many developers find it easier to use. Google started supporting this option in 2016, including breadcrumbs. 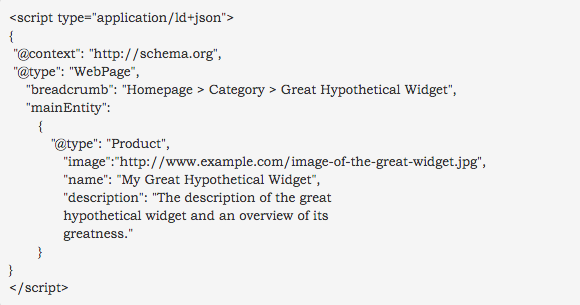 You can use JSON-LD to markup for review and product rich snippets. And according to SEM Post, you can use JSON-LD with other schema markups on the same page with no risk for a manual action penalty. This is good news if you also optimize for Pinterest’s rich pins, since they only support microdata. 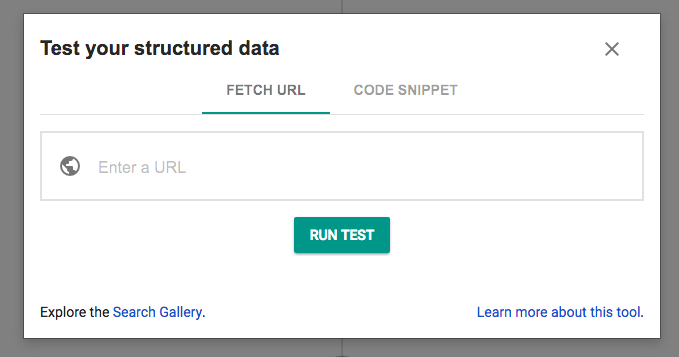 If you have a spammy structured markup manual action penalty, Google recommends using their Structured Data Testing Tool to look for issues with your rich snippets and other structured data. Using the tool is just good practice in general, since it will identify any errors in your structured data. The tool was updated in 2016 to make it easier to use (keyboard shortcuts, independent testing tool results, etc). Schema.org and JSON-LD will auto-complete in the testing tool, and there’s also a rich cards report in Search Console. There are a lot of benefits to using structured data on your webpages when optimizing for search. Developments in 2016 have expanded the possibilities even more, and I’m looking forward to seeing where it goes from here. How are you using SEO markup and structured data on your site? Tell me in the comments.